Machine is emotional. Computer graphic builds up self-identity in the love-and-hate relationship with each other. It could be considered as my own definition of artificial-intelligence. Borrowing the intersubjective theories of psychoanalysts, in this installation, computer graphic is assuming illusory concept of “individual” from Others, so as human. Both desire to be desired. Both desire to loved and recognized. The desire to control and win provokes pleasure, excitement, jealousy as well as frustration. Human and machine are thus tangled with love and hatred. The installation is a projected environment in where schools of 3D computer-graphic subjects roam around. Since the environment is projected on the gallery floor, participants can walk around on it. The interface is oral. While hearing the sound made by the graphic subjects, each of the participants will also has a hand-held microphone and makes any sound to respond. A computer-graphic subject shows its form in 3D abstract format while generating sound with changing pitch (frequency). The visual form changes dynamically according to the pitch. Thus, the graphic subject’s sound is indeed the fundamental essence which defines who it is. However, since the sound is not inborn, an infant graphic is nothing in the environment. Sound and “self” has to be developed in intersubjective relationship. Desiring to be the “one” who is loved and admired by Others, graphic subjects hear and imitate the sound of each other, and also participants, or modify own sound to fit the “good” sound generally recognized by Others. While all the graphic subjects (also including participants actually) desire and imitate what others desire in one’s own understanding, a general concept of “good” sound is gradually formed in the environment because of reciprocal effect. It is a general and universal concept of “I”. This fictional concept is just waiting participants to step-in. It is the remains of all the previous participants and computer graphics’ behaviors. It responds that there is always an imago belongs to the realm of social and cultural conventions which pre-exist before an infant’s birth. A participant will notify that the graphic subjects are making similar sound, and being ignored unless s/he imitates the “good” sound. During the exhibition period, participants mostly expect to manipulate the graphic through making sound at first try. They are looking for the power of control in normal interactive interfaces. It is a kind of master-slave relationship or subject-object relationship. They are used to it. When the graphic subjects do not give satisfied response, participants would complain and be confused. However, once s/he imitates the sound of graphic subjects, some of them might then fall in love with the participant, come closer and show bright color to express their love (and also hate). Thus, a participant recognizes that s/he has to imitate the computer graphic to interact. It could be a new possibility of interactivity in subject-subject relationship. That is why I always call the computer-graphic as subjects but not objects. Unfortunately, desire can never be fulfilled. Even a “successful” participant will eventually recognize that s/he can never win all the graphics’ love. Moreover, a graphic would express love and hate at the same time out of the participant’s expectation. It is actually a game which is impossible to win. Most participants would keep working hard to fright for love, few of them might give up. 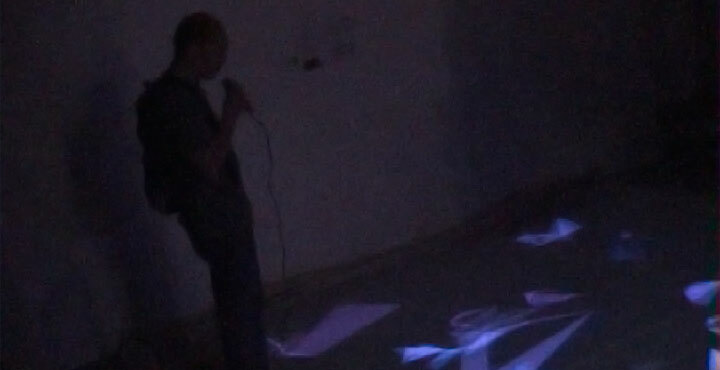 Once gives up and just enjoys the audio and visual environment in relaxed mood, a participant might eventually escape any imago or convention. Another kind of extraordinary experience would be awarded. “Individual” is not independent and self-sustained. An individual’s existence is dependent on the existence of other individuals. The concept of “individual” or “I” is also not innate. It is an illusion and imago. Both human and machine can assume this imago to be an “individual”.